Most babies start teething between 4 and 7 months and have all 20 baby teeth by age 3, but teething patterns vary for each child, and late teething probably is nothing to worry about. What you attribute to teething might be due to early eruption of new permanent teeth. If you have concerns about your child's teething patterns, see your pediatrician or child's dentist. An older child who is teething might experience extra saliva, gum swelling and bulging, in addition to gum pain and sensitivity. When her gums bulge, the outline of the erupting tooth usually is visible inside the gums. The second molars are the last primary teeth to erupt on the top and bottom, usually around age 3, athough this may occur later if her other baby teeth came in late. There are large variations in teething. Some children are still not teething as they turn 1, and, rarely, some children are born with a couple of teeth. The rate at which teething occurs is reliant on a child's genetics. For example, if both parents were early or late teethers, a child probably will follow the same pattern. The order and timing of teething does not mean the child is unhealthy or developing incorrectly. Your 4-year-old child might be getting his permanent teeth rather than his baby teeth. Children begin losing baby teeth to clear the way for permanent teeth between 4 and 7 years of age. Before a baby tooth becomes loose and falls out, a permanent tooth pushes its way up through the gum line to replace it. The first permanent teeth to erupt usually are the incisors, which are the lower and top center teeth. The eruption of permanent teeth to replace baby teeth is seldom painful. If your child is experiencing pain in the back of her mouth, it could be related to early eruption of her six-year molars. Her aching won't last long, but you can administer acetaminophen or ibuprofen for short-term relief. The best way to get reassurance that your child's dental health is fine is to take him to the dentist. A dental problem is unlikely, but the dentist can examine your child's mouth and get an X-ray if necessary to make sure there is no issue under the gum line. 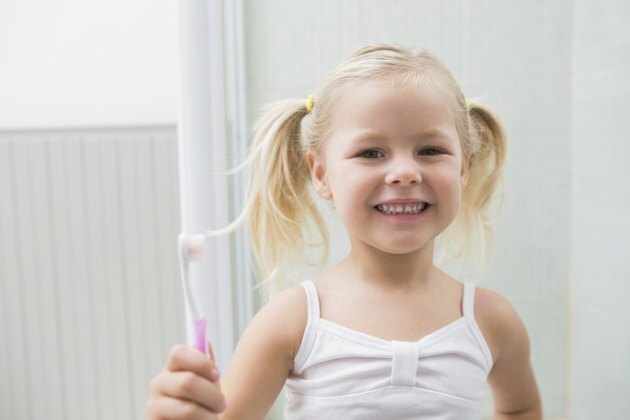 When Does a Toddler Cut Molars? How Long Does it Take for a Baby to Cut Molars?